This blog was originally published on April 8, 2014 and was written by Brittany O’Malley. Whether it’s the tradition of spring cleaning, or the demands of our busy chaotic lives, I’ve noticed that the concept of “de-cluttering” seems to be a hot trend lately- websites ranging from Oprah to zen blogs to Buzzfeed are talking about ways to simplify our lives through the process of “de-cluttering.” But why is “stuff” bad? And in the craziness of our daily lives, who has time to de-clutter? Why is clutter a bad thing? Disorganization has been linked to increased stress and decreased productivity, not to mention greater risk of injury (because you are far more likely to trip and fall if your space is a mess!). On the flip side, simplifying your space can help save time and money, decrease germs, and promote focus. So why is it so hard to get rid of things? Even though it seems clear that clutter impacts our emotional, physical, and environmental wellness, it’s still really hard to let go of things. Why is that? A recent study at Yale found that the same area of our brain that fires when we burn our tongues on hot coffee or stub our toes also lights up when we get rid of items. So it feels painful for us to give things up. Another study showed that just holding or touching an item can cause emotional attachment. 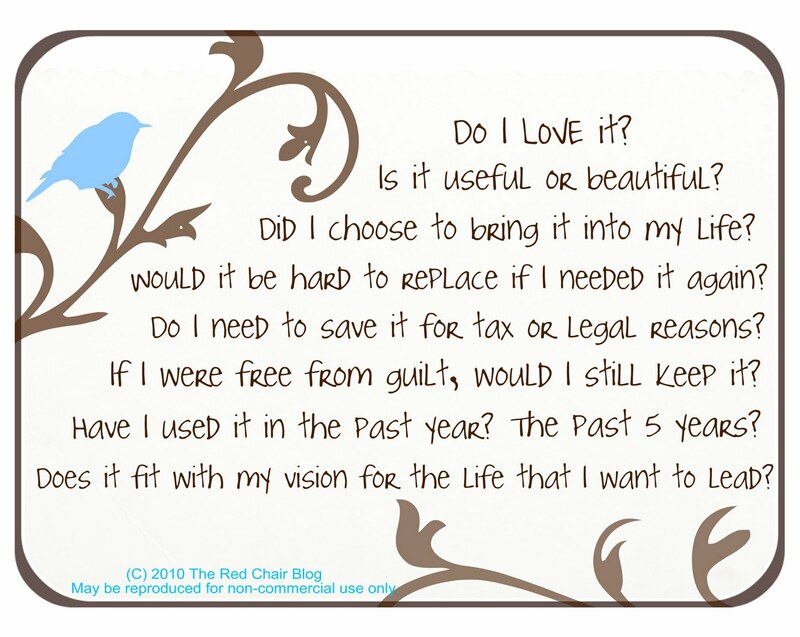 So of course it’s hard to throw that item away – you feel invested! Now, of course this might not be true for everyone. There is a full continuum of “messy” to “neat” types of people out there, which means that tossing stuff is easier for some than others. Overall, though, tidying up your physical, social, and virtual spaces increases clarity in a world full of chaos. Focus on one thing at time. Take 10 minutes a day to focus on one de-clutter task: the pile of laundry on the floor, your desk, emptying your backpack. Don’t feel like you have to clean up your whole life all at once- baby steps! Monitor your social “clutter.” Clutter comes in many forms, including the things we put on our calendar. Be ruthless about saying no or postponing new commitments if your life feels too busy to manage. Tackle your virtual and mobile world. Take a minute at the end of the day to clear off your computer desktop. Control what phone notifications you receive (do you really want to know every time a celebrity tweets their post-workout snack?). When we are online, we are bombarded with a constant flow of information, so be proactive about setting filters and systems that work for you, not against you. Don’t worry about perfection. Striving towards simplicity won’t look the same for everyone. Figure out what your “perfect storm” of stuff is and set an attainable de-clutter goal. If you have a roommate, it’s good to talk through what works for them, too- your styles may be different. Next Article How your eating habits can help create a healthier environment!